A super flavorful Paleo, keto, and Whole30 dinner that cooks in 6 minutes in your Instant Pot!! Meet Paleo Instant Pot Chicken Adobo! And even if you have no special diets to accommodate, this is a kid-friendly meal that takes almost no effort to prepare! One of my favorite things about this chicken adobo is how little I have to actually prep! Only one onion chopped, then all other ingredients I just measure and pour….boom! Once it is all complete, the tender and flavorful chicken adobo can be used in SO many ways!! Stuffed in some fathead dough with some sauteed veggies for a hand pie! NO INSTANT POT? NO PROBLEM!! You can place all ingredients on the stove top (or slow cooker), just increase your cooking time. About an hour on the stove, about 3 hours in the slow cooker. The rest of the instructions will remain the same! Salt and pepper your chicken thighs. Brown your thighs in some coconut oil, do not crowd the pan. This may take a couple of batches. Place the thighs in, wait 3-5 minutes until a nice crust is forming, then flip and do to the other side. Once all thighs are browned, place all the meat back in the pot, add all the remaining ingredients, lock the lid on. Using the 'manual' button, decrease time to 6 minutes for boneless, 12 minutes for bone-in. When time is up, cancel, quick release. Turn on the saute feature again. Boil off the liquid until it condenses and starts to caramelize. Serve atop some cauli rice, or an Asian slaw for a well balanced meal! Oh, this looks so good. I need some new chicken inspo. Can’t wait to try it. YUM!!! Love instant pot recipes and this chicken abodo look so simple and so delicious. YUM !! Heck yes! This looks soooo good and omg I can eat it because it’s nightshade free AND keto!! Whoot Whoot!!! I love the flavor coconut aminos add! This recipe and the others listed are all getting pinned! This looks so good – I mean so good I can see myself eating it straight out of the fridge for breakfast! Love how quickly this comes together, and I just love the flavors in this! Looks so delicious and I love that you can repurpose it in so many ways. Oh this looks so yummy! IP really makes the best chicken meals … chicken adobo is a favorite in my home and your version sounds great! 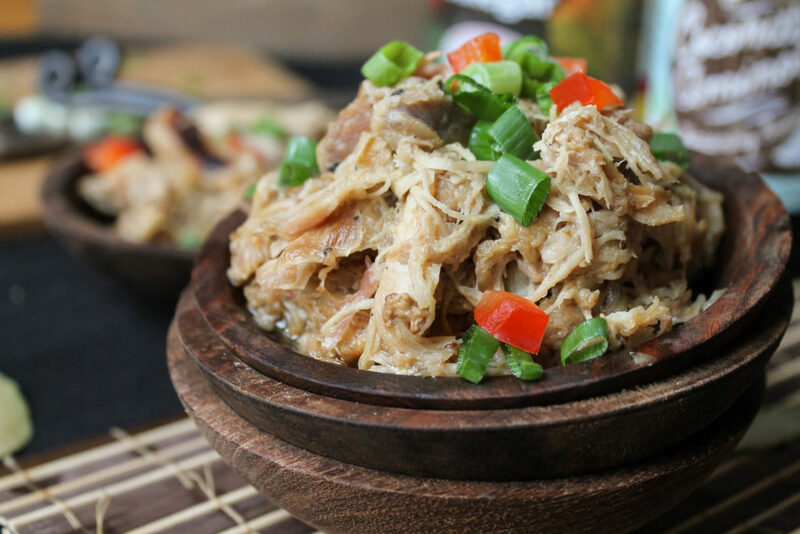 Loved this delicately flavored, shredded chicken! First time I tried coconut aminos instead of soy sauce or tamari, and I love how mild the flavor is (and less salty). I made it yesterday in the slow cooker on high for three hours, then I poured the sauce off onto a pan on the stove and heated it up to caramalize, then poured back over the chicken (which I had shredded in the meantime). This really was SOOOO easy to make. I ate it straight out of my tupperware for lunch today, then tonight for a real treat I stir fried it on the stove with a splash of trader joe’s toasted sesame oil, which made it super flavorful, and served it up with steamed veggies. Thank you, Tessa! Love the addition of the sesame oil!! So glad you are enjoying this easy dinner! EERR MAG GRRR, Tess, guess what I did tonight. WELL, this morning I made some date paste because I ran out of honey and I didn’t want to just go out and buy a sticky sweetener when I had a bunch of dates sitting in the cupboard during out. So tonight I stir fried the chicken adobo leftovers (just to warm them up) with a little of the sesame oil again, steamed veggies, quinoa (I may be gluten free but I’m not grain free) and a TABLESPOON OF THE DATE PASTE. It was EPICALLY good. I LUV sweet and savory creations!! Thanks again for this great staple recipe. I look forward to making it for my family again and again. Oh yes…sounds lovely!! You could use chopped dates in the sauce when cooking and puree the whole kit and kaboodle at the end (instead of palm sugar), slurp! I only have a slow cooker – I see the note for cooking 3 hours – I assume that’s on “high” setting? yes. And I am basing this on my CrockPot which seems to be HOT!! As long as the chicken is shreddable, it’s long enough! I bet the pineapple juice is an awesome addition – Whole30 or not! I love the apple sauce or pineapple sauce substitute! They’re my go to sweeteners! Yes, depending on dish, many fruit purées are excellent for that sweet hit! Mango and peach are also good! This looks amazing. Love that little bit of palm sugar. Yum! yes, it is good both ways..palm sugar or applesauce as preferred! I was thinking a couple of sates might be delicious as a sub too! 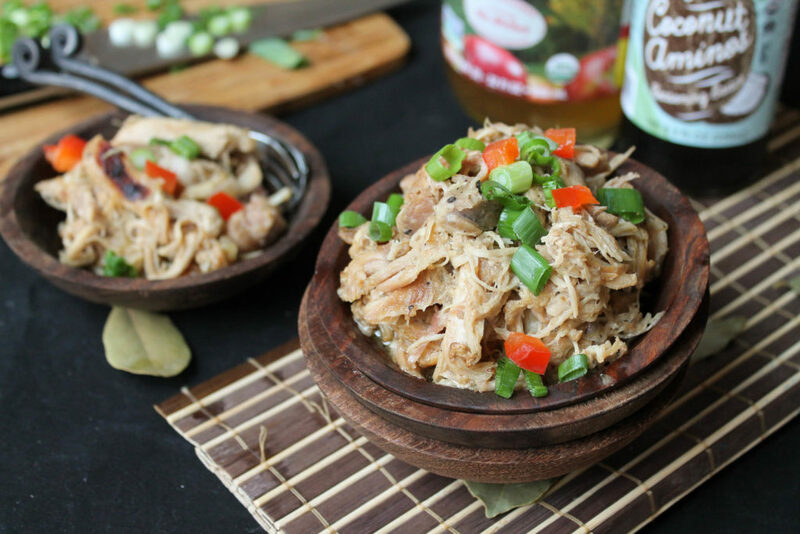 I love chicken adobo and this version looks amazing! Even better that you can make it in the Instant Pot. Love it! Pinned to my Whole 30 board. Thanks for the W30 option! So fast and easy! My family likes these flavors so this will be a big hit! The photo looks so so good and delicious! I’m totally a newbie to this keto paleo diet. Can’t wait to give it a try. I am here if you need any help or have any questions on your new journey Diane! !